In volume 2 of Enlightenment, we will discuss a variety of new, and diverse, items added to our site, from contemporary antique light bulbs to hydroponic horticulture nutrients. With an assortment of products such as these, you won’t be disappointed with this article, so sit back, relax, and be enlightened. Light your home Edison style! These unique, tubular antique light bulbs are the perfect way to give your home a vintage look. Beautiful for interior and exterior lighting, the spiral tungsten filament of the bulbs creates a warm amber glow that sets a welcoming and peaceful ambiance in any room. With a candelabra base, they are perfect for chandeliers, pendant lighting, and more. Give your home an antique feel; shop our selection of antique light bulbs! Leviton's new combination USB and receptacle chargers can charge two electronic mobile devices synchronously via the USB ports, while leaving the receptacle free for any other power needs. The USB receptacle is perfect for use in residential spaces such as kitchens and home offices, as well as light commercial spaces such as airport cafes and office cubicles. Pair it with the USB receptacle with the Leviton Mobile Device Station for added convenience. Visit our site to see if the Leviton combination USB and receptacle charger is right for you! The LEDnovation GEN2 EnhanceLite A19 omnidirectional bulb is perfect for any multi-purpose lighting needs. Considered as one of the world's most efficient LED light bulbs, this dimmable, warm white bulb uses only 13.7 watts and is the perfect replacement for a 75 watt incandescent. It has a color rendering index of 90 and does not contain mercury or lead. 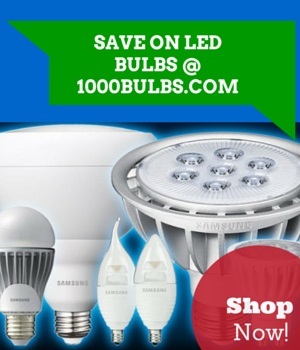 This LED bulb has a life expectancy of 50,000 hours and comes with a five-year warranty. Check out the EnhanceLite A19 and see if it suits your lighting needs! The new RAB LED slim wall packs are sleek and elegant, perfect for any indoor or outdoor lighting decor. Functional as a downlight or uplight, the wall packs come in a variety of wattages, with either a bronze or white finish; you choose the one best suited to your needs. They are UL listed for wet locations, IDA Dark Sky approved, and include a five-year warranty. Give any location that crisp, clean fixture it needs; browse our assortment of RAB LED slim wall packs! In Enlightenment: Vol. 1, we mentioned that grow lights were new to our site. Now, we have added horticulture nutrients and supplements. The Bloom Blaster by Grotek is a hydroponic plant nutrient powder that helps plants mature properly. Effective in all growing media, it helps your plants to develop beautifully. Mighty Wash by NPK Industries aids to rid your plants of insects and spider mites and can be used in all stages of the flowering cycle. FloraBloom by General Hydroponics functions as a bloom development stimulator to improve the quality of plants during the flowering stage. See your plants grow to new heights with our new horticulture nutrients and supplements!